A Story + Art = A Great stART! Welcome to stART! I hope that you will enjoy our book and art project and maybe even share your own too! For an explanation of stART click here. 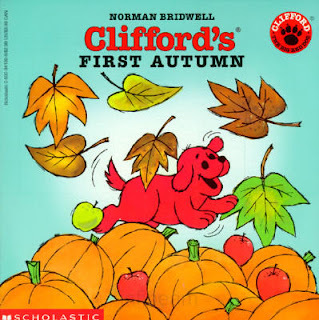 This week we read Clifford's First Autumn, by Normand Bridwell. This is a cute book that talks about some of the changes that autumn's cool weather brings, such as pumpkins, leaves changing colors and falling from the trees and kids playing football. After Emily, Juliette and I read this book we talked about how the leaves on our trees were changing color and falling to the ground. I thought it would be fun to make our own fall leaf collage to go along with this book. Emily was very excited to go on a leaf hunt in the yard to find leaves for our project! Emily picking up a leaf to put in her bucket. I gave Emily watercolors to paint the paper for the leaf collage. Emily glued the leaves onto the paper. Blueberry Pancakes (Leaf Man) Our First Time! Looks fun! I can't wait for the leaves to change around here. I love her leaf collage, she did a great job! By the way, I have been praying for Juliette and your family this week, and will continue too. So cute! Abby checked this book out from the library last week. What fun with leaves! 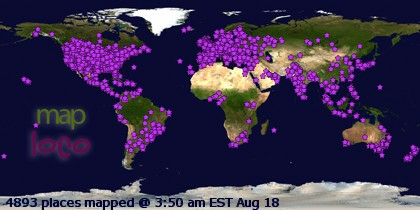 Thanks so much for hosting this (especially after a hectic week), we really enjoy joining in. This is so cute! She did a very good job! I am keeping you all in my prayers and hope that Juliette is feeling much better and you get some answers soon! Hope Juliette is doing better, I can't imagine how scary going through that must be. Your in my thoughts and prayers. Hi there, I'm a day late, but thought I would join anyway...Hope that's ok. I hope Juliette is doing better. We made a digital leaf collage this week and leaf prints. "Fall" seems to be the theme of the week! Sounds like a delightful book for this time of year. What a fun project. Young children would enjoy this process - the collecting of the leaves, the painting and the gluing. I just found your blog and am so glad I did! stART is such a great idea--I'll be joining the next one for sure. We went on our own leaf hunt this week (I have a little Juliet also.) Thanks for the great ideas. stART ~ I Know an Old Lady Who Swallowed a Bat!